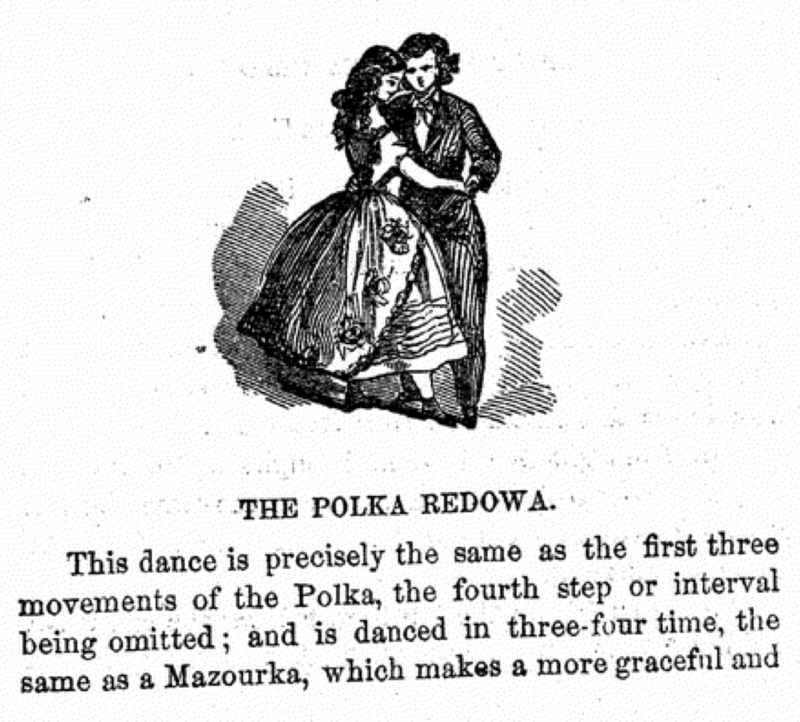 The Polka Redowa is a mid-19th century couple dance that adapts movements of the Polka to 3/4 time. According to Allen Dodworth, it was introduced in 1852 [AD85]. The proliferation of music for the dance shortly thereafter is consistent with this date. Waltz position throughout [TH57, TH58, TH63]. 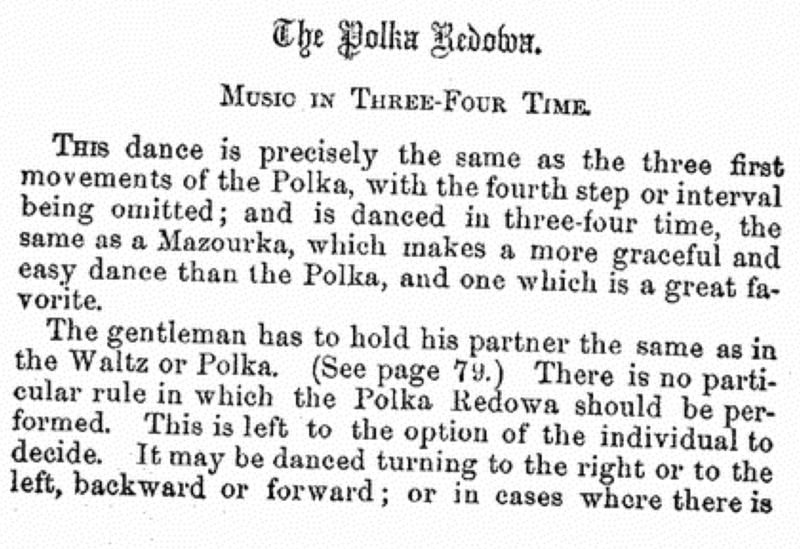 One source notes that "the name indicates the dance; Polka step, Redowa time" [MG90]. Many others have similarly simple descriptions [DS69, TS78, CB79, GW84, GW98, TS91]. Where the step is fully described, it's described as a slide (1), close/cut/change* (2), leap (3), turning 180° to the right on the leap. Most sources also have a slight hop on the "&" (i.e., 16th note) before 1 [TH57, TH58, TH63, AD85, AD88, EW94, EW97, AD00], but not all do [EF59]. * Hillgrove and Ferrero technically describe this as a close to third position, but the fact that Hillgrove raises the first foot forward at the same time suggests more of a cut [TH57, TH58, EF59, TH63]. Dodworth and Witherspoon describe it as a "change" [AD85, AD88, EW94, EW97, AD00]. 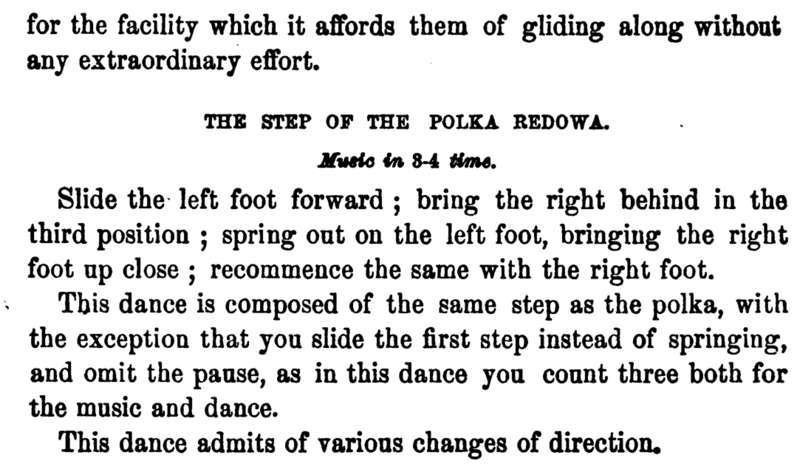 Several sources note that it can turn both to the right and to the left, and that it can also be danced straight forward or backward (Promenade or Pursuit), or even in place (Balance or Set) [TH57, TH58, EF59, TH63]. 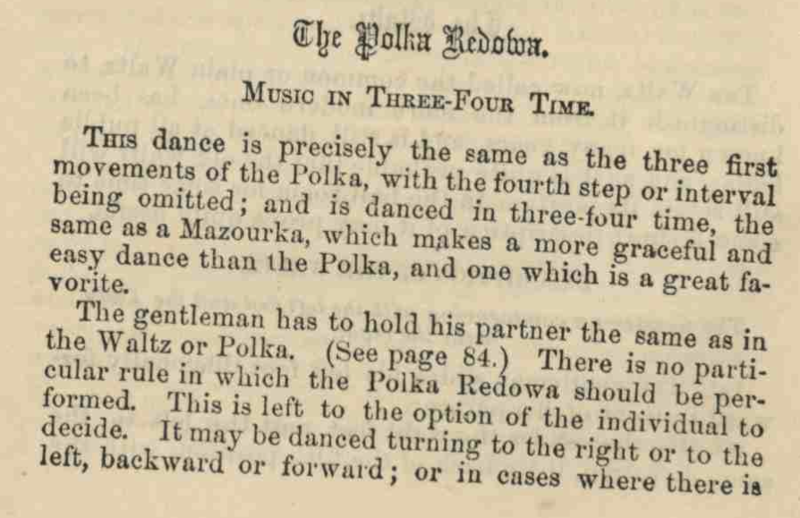 Usually specified as redowa [AD85, AD88, MG90, TS91, EW94, EW97, AD00] or mazurka [TH57, TH58, TH63, CB79] music, but there were also many songs at the time that were written specifically as polka redowas. For a list of over 100 polka redowas with free downloads of the sheet music, see Polka Redowa Music. 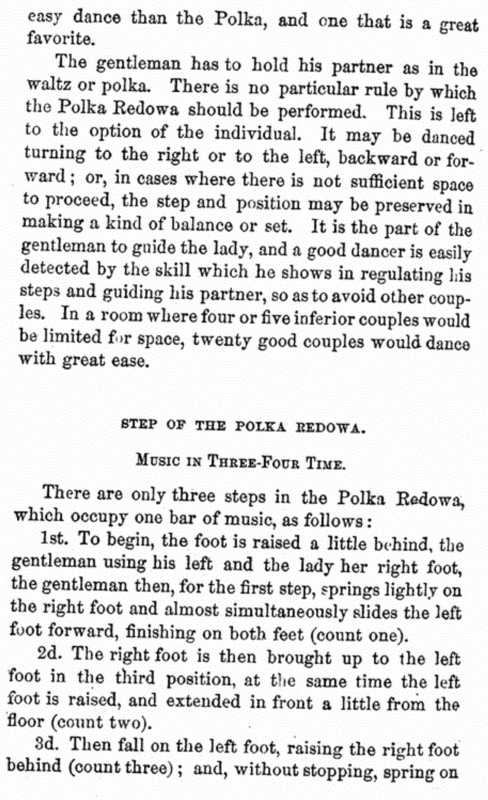 Dodworth specifies 60 half notes per minute, or 120 bpm [AD85], which Tousey & Small notes is "much slower than in any other" dance, so it is "not quite so fatiguing, and is therefore more generally preferred" [TS78]. TH57 — Thomas Hillgrove. (1857). The Scholar's Companion & Ball-Room Vade-Mecum. New York. TH63 — Thomas Hillgrove. (1863). 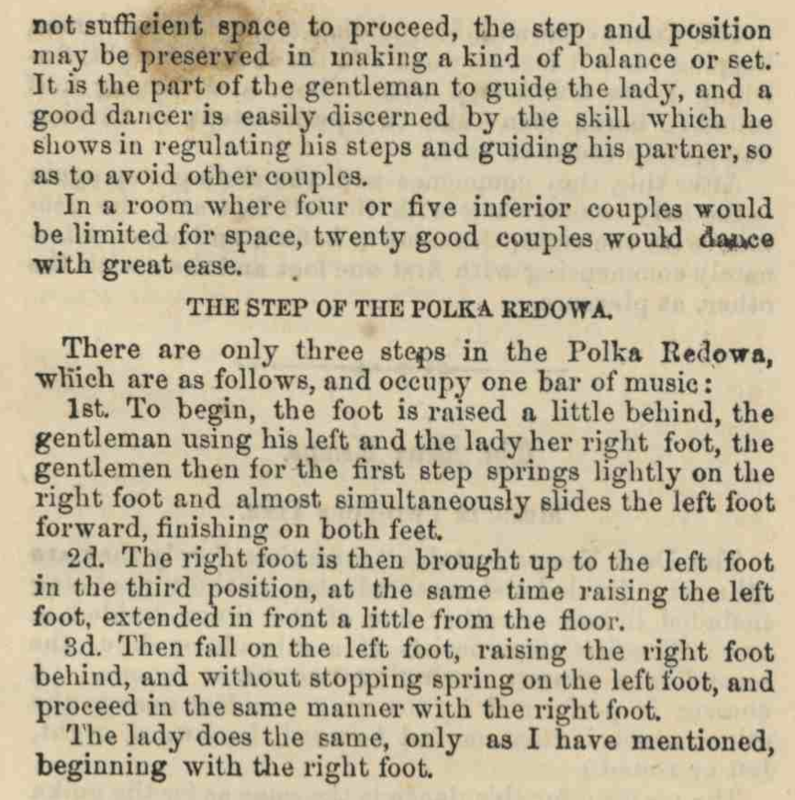 Hillgrove's Ballroom Guide - Practical Dancer: A Complete and Practical Guide to the Art of Dancing. New York. DS69 — D. Spencer. (1869). Spencer's Terpsichorean Monitor. Peoria, IL. TS78 — Tousey & Small (pub.). (1878). How To Dance, A Complete Ball-Room & Party Guide. New York. GW84 — George E. Wilson. (1884). 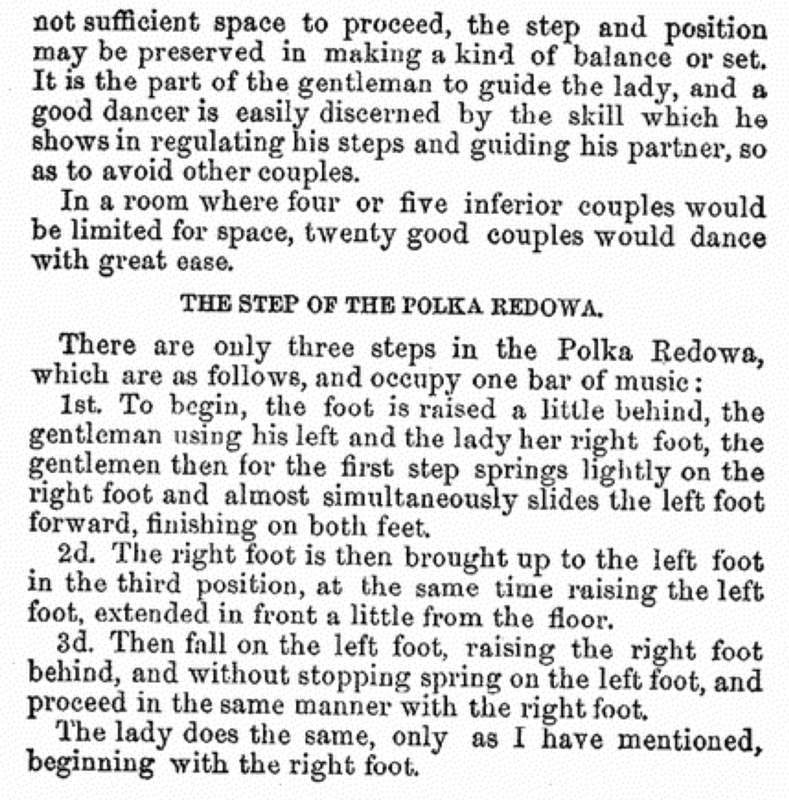 Wilson's Ball-Room Guide; Or, Dancing Self Taught. New York. AD88 — Allen Dodworth. (1888). Dancing and Its Relations to Education and Social Life (New and Enlarged Edition). New York. TS91 — "T. Erp Sichore." (1891). A Treatise on the Elements of Dancing. San Francisco. EW94 — Edna Witherspoon, Butterick Publishing Co. (pub.). (1894, May). The Perfect Art of Modern Dancing, Vol. 7, No. 2. London. EW97 — [Edna Witherspoon], The Butterick Publishing Co. (pub.). (1897). The Perfect Art Of Modern Dancing. London. GW98 — George E. Wilson. (1898). The Little Dancing Master. New York. AD00 — Allen Dodworth, T. George Dodworth. (1900). Dancing and Its Relations to Education and Social Life (New and Enlarged Edition). New York.